I'll be honest, I could never come up with a good reason say anything nice about Auburn. Then, Samuel Mockbee co-founded Rural Studio at Auburn, and I must admit, it has been pretty great. Under Mockbee's guidance, the architecture students created affordable housing for some of the poorest residents of Hale County, Alabama. After his death, Rural Studio continued to innovate and thrive. 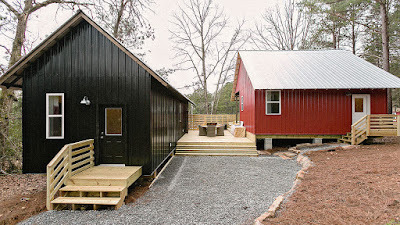 Lately, Rural Studio has been working to take all their innovations and combine them into a simple house that is attractive, livable, and affordable. By affordable, I don't mean $200,000, I mean a tenth of that -- a $20,000 house. The first houses of this commercial endeavor were built at a development called Serenbe in Georgia. The houses are used as artists residences. There have been numerous articles about these two houses, but the best is by Adele Peters in Co-Exist. It explains a lot of the problems such a good idea faces. Sambo would be so proud! Here's to working out all those problems.